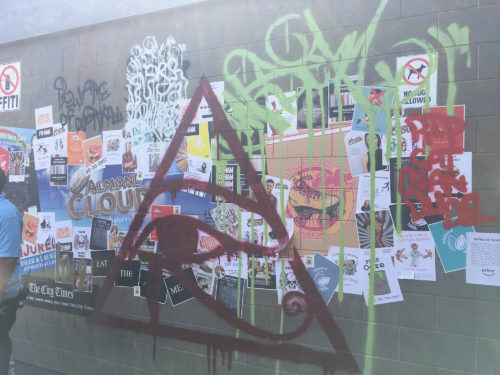 On the corner of J Street and 1st Street in San Diego’s MLK Plaza, you will see a giant blue skullcap with moving antennae. 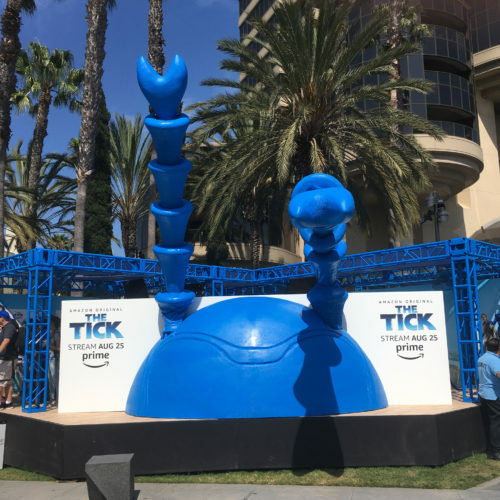 If you haven’t caught all the other signage, this would be the dead giveaway: THE TICK IS BACK! Peter Serafinowicz’s implacable piercing blue eyes stare from many different angles. 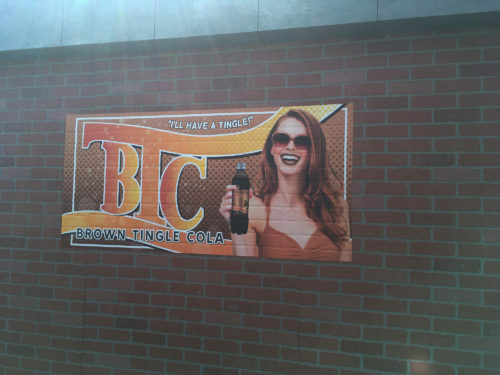 They’re warm, yet subtly manic. This is a hero, perhaps, for our times. Granted, he’s been reinvented a few times from comics to television since the early 1990s. 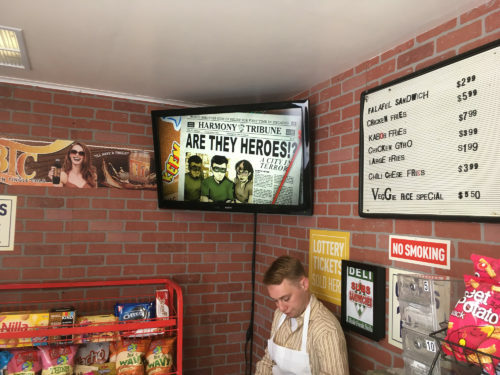 This time around, Amazon Prime has developed a darkly funny show that will debut on the streaming service on August 25. 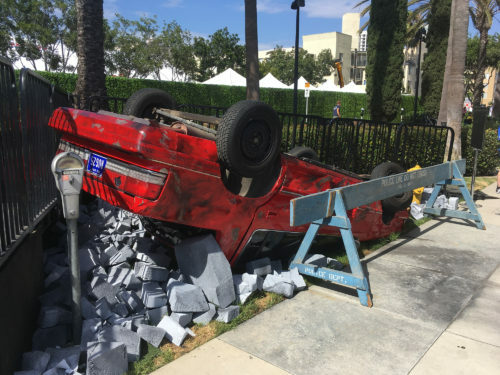 And in case that date hasn’t stuck in your head, there are clues all around the Comic-Con installation to remind you of that date. 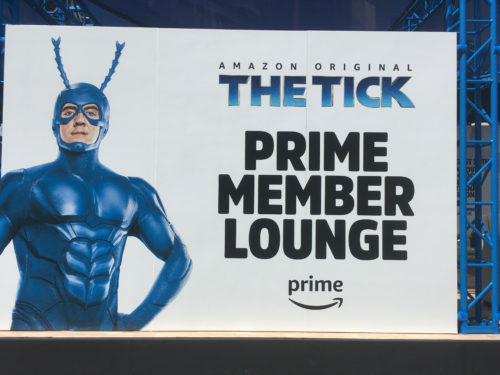 “The Tick Takeover” has three segments — an Amazon Prime member’s lounge where you can register, get a wristband, and watch the pilot if you haven’t already. If you’re a fan of the short-lived Fox series, this version is definitely bleaker in tone, though setting up The Terror (Jackie Earle Haley) as the arch-nemesis of (at least) the first season. 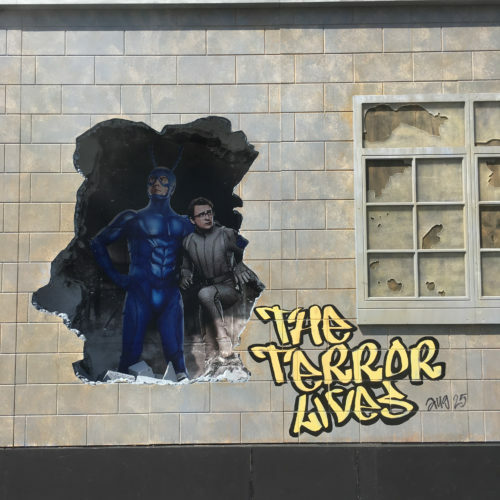 In both the animated series and the previous live-action one, the world’s oldest living supervillain was a one-off, but here he’s definitely a nemesis to be reckoned with for Arthur (Griffin Newman) and his super-powered best friend the Tick (Peter Serafinowicz). 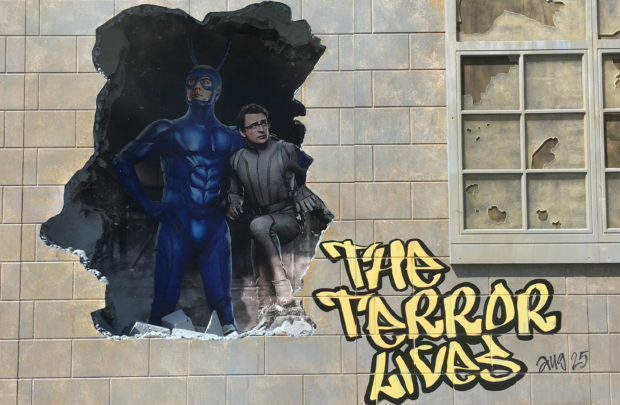 From the lounge, fans can head over to the second piece, where they can personalize a piece of swag and get the highest honor of them all — the chance to affect the Tick’s mood. Control levers shift the giant antennae, perhaps to the confusion of casual passers-by. 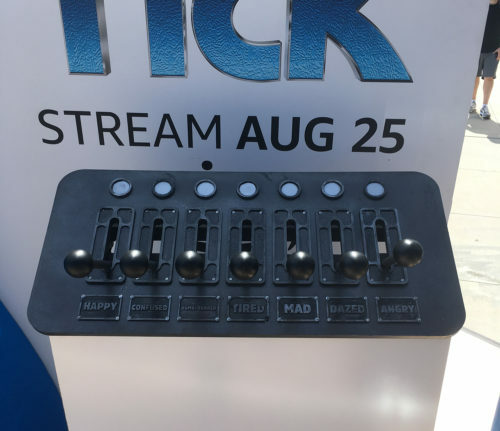 Each lever has a labeled emotion, which, let’s face it, is crying out for a t-shirt or set of emojis from Amazon. Keep an eye out for that prediction to come true. Once the challenge is completed, fans get their reward, and this is a pretty good perk. 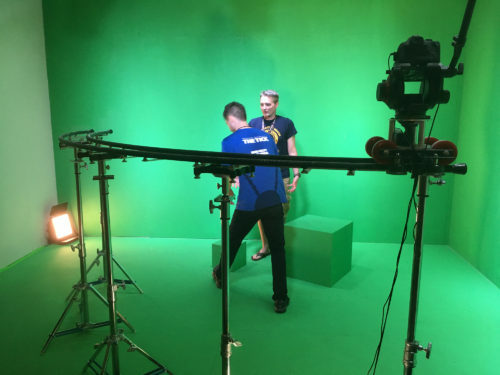 A green-screen 360 video shoot occurs, allowing participants to either fly or explode. I chose explosion. Then you pick up a t-shirt and return to the real world. But this is one heck of a diversion. 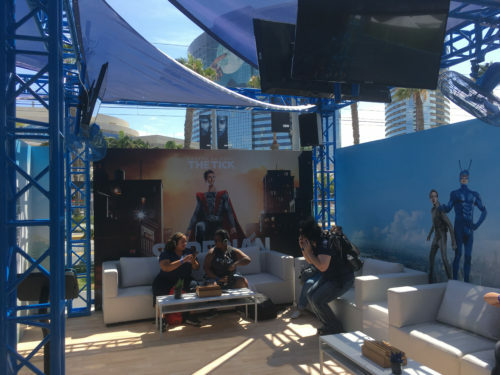 This is one of the most complicated and cool installations I’ve seen at Comic-Con; for full immersion, the only one that tops it was the one Legendary Studios brought for Godzilla a few years ago. If you’re here at Comic-Con and you have the time, this is worth the wait. I’m hoping the series is, too.